Sales support and customer service at European Exhaust and Catalyst has been bolstered this September, with two new additions to the Business Development team at the UK emissions products manufacturer. 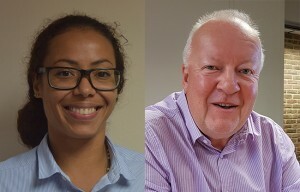 Duncan Richards, Director of Sales, comments: “As part of EEC’s commitment to outstanding customer relationships, as well as our rapidly developing EEC France office, we are delighted to be welcoming David Clancy and Sertoria Costa to the company”. David Clancy is joining the company as Business Development Manager, with responsibility for our expanding Export customer base. David has extensive automotive industry experience, and is well-respected globally for his aftermarket knowledge. He will be representing European Exhaust and Catalyst across Europe, as well as Revcoat Technologies and Prolazer Components. David comments: “I’m especially excited at the opportunity that EEC and Revcoat Technologies offers, primarily from our coating facility where we have the ability to develop and manufacture bespoke products quickly in house. With our new presence at EEC France, speedy distribution across Europe gives our customers a better service”. Out of working hours, David is a supporter of Derby County, enjoys travelling and a round of golf. Sertoria Costa is welcomed to EEC France in the role of Business Development Manager for our presence in mainland Europe. With exceptional customer service skills attained in a number of different industries, she will be responsible for building relationships with French independent dealers, buying groups, motor factors and wholesalers. She comments: “It was great to meet so many customers at the recent Automechanika Show in Frankfurt, and I’m looking forward to directly supporting the French market and introducing them to the wide range of emissions products that we offer.” In her spare time, you can find Sertoria drawing and practising her Jiu Jitsu. European Exhaust and Catalyst Ltd is the one-stop shop for emissions products in the UK, providing catalytic converters, DPFs, exhausts, front pipes, braking, the EEC DPF Diagnostic Tool and Accessories for the global aftermarket. We’ve recently launched our new EEC Diesel and Petrol 6 in 1 Solutions, underlying our commitment to driving forwards innovative emissions products and continuous improvement. With over 40 years experience as a family run company, our personalised, flexible service guarantees our customers superior products and service. We also go that extra mile to ensure you are aware of all the latest industry knowledge through our technical training and educational programmes.